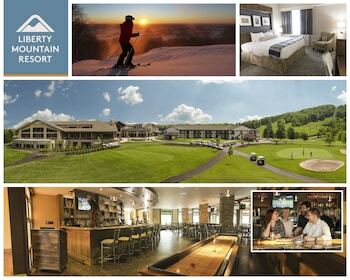 Located in Carroll Valley, Liberty Mountain Resort is in the mountains, a 2-minute drive from Carroll Valley Resort Golf Courses and 6 minutes from Liberty Mountain Ski Resort. Featured amenities include a computer station, a 24-hour front desk, and luggage storage. This resort has 10 meeting rooms available for events. Free self parking is available onsite. With a stay at The Historic Fairfield Inn in Fairfield, you'll be within a 5-minute drive of Mountain View Golf Club and Carroll Valley Resort Golf Courses. Free self parking is available onsite. With a stay at Colton Motel Gettysburg in Gettysburg, you'll be just steps from Gettysburg Diorama & History Center and Gettysburg Heritage Center. Free self parking is available onsite. With a stay at Inn at Lincoln Square in Gettysburg, you'll be just steps from The David Wills House and Majestic Theater. Free self parking is available onsite. A stay at James Gettys Hotel places you in the heart of Gettysburg, steps from The David Wills House and Majestic Theater. Free self parking is available onsite. A stay at Econo Lodge Gettysburg places you in the heart of Gettysburg, within a 5-minute drive of The David Wills House and Majestic Theater. Free self parking is available onsite.